The 40th Tokyo Motor Show once again proves we’re living in the golden age of auto design. 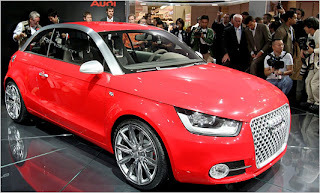 Check out the Audi A1 Metroproject Quattro Concept above, a little study for small, urban vehicles — in this case with 191 horses from a turbocharged gas engine AND a 30 kW electric motor. It’s efficient, fast, and if it ever makes it to market, probably affordable in the $27,000 range. Now, let’s look at a little BMW from 1973 — the model 2002tii 2.0 fuel-injected hunk of junk that looks like a low-end Toyota. The model began life as the BMW 1600 in 1966, an 85-horsepower two-door sedan that was laughed at in the era of monster Thunderbirds with 345 horsepower. So BMW engineer Alex von Falkenhausen decided to build a “muscle car,” and swapped out the 1600’s engine with a 100-horsepower 2.0 liter to create the 2002tii. 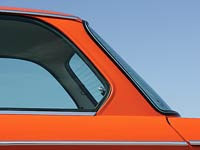 The car came in 1970s glare such as lime green and bright orange, had flat vinyl seats, and the steering wheel was cheap plastic. Back in the early 1970s, this was state-of-the-art technology, and because the little car could (barely) top 100 mph, Germans nicknamed it the Flsternde Bombe, or “whispering bomb.” The sheet metal looked like it was cut and bent by hand. Which brings us back to Tokyo. The emerging cars give us twice the acceleration, double the mileage, and incredible designs. Computer technology has democraticized good taste. It’s funny to look back and think of BMW once trying to catch up to Detroit on design and torque. Now, if only the U.S. could catch Japan, China and Europe in terms of our gas mileage.